Did that really happen, or did I dream it? In the film Being There, Peter Sellers’ character uses his television remote to try to transform reality. On Sunday, as I tuned into the African Champions League second round second leg tie between Zamalek and Saint George, and I found myself flicking to a channel that had me transfixed from beginning to end. The distinction was that I found myself on this channel from my laptop, via the convenience of internet streams, and it was entirely calculated, but the general point still stands. As with a lot of African continental club matches, there was that significant, will-I-won’t-I-find-a-stream pre-game doubt; hope only heightening into consummate belief due to the fact that a Maghrebi team was involved and Ethiopian football is becoming increasingly streamable. Come kick off, requests and searches for a stream were met with a thundering silence, but, thanks to the African Football Experts, a stream would eventually arise. From there on in, reality was changed. The dictum is that there isn’t a match-going culture in Africa, empty seats are a biennial criticism by casual observers of the African Cup of Nations and par for the course at club level. Whilst these smirches are completely understandable when you factor in the miniscule disposable income Africans have, the overall ambience fails to capture the hearts and minds of the aficionados who follow world football so ardently. After all, the jogo bonito in excelsis choreographed amidst the backdrop of the samba, exotic beats is what makes South America’s Copa Libertadores so captivating. The Fan Experience is also a large part of European football’s allure, and part of German football’s re-emergence and potential; the state of the art stadia filled to the brim an incentive to investors. When compared against the other continents, African football is more Patrice Carteron faced-off against Sir Alex Ferguson. Another dictum, a more favourable, otherworldly one, are the sounds emitted from the stands. As David Goldblatt writes in the seminal The Ball Is Round, ‘African football…vibrated to a different energy. Percussion is ubiquitous in African football: drums, rattles and shakers of every kind and size provide the essential beat of the stands. Customs vary but unlike European crowds whose music rises and falls with the fortunes of their side, African crowds maintain their rhythm throughout a game – some do not even pause to celebrate a goal or take a dumbfounded break when they go behind’. 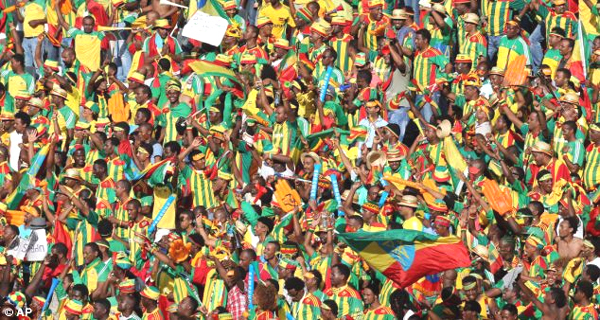 Yet the atmosphere at Ethiopian football matches seems to be an antithesis of that. Given St George’s were involved, you could have been excused for thinking their match against Zamalek was a jingoistic, English Defence League-empathising congregation celebrating the birth of England. It was gentle but joyful proudness that, at times, flickered into defiant and strident, sending many of the 35,000 wide-eyed fans into ecstasy when the St George goals went in. Prolonged, goosebumps-stimulating chanting and singing filled with smiles and ready-to-smile subtlety etched on the faces of the fans. The plastic flags waving may have made the anti-vexillologists vomit, but there were no vuvuzelas in sight. It was an ambience that was reminiscent of the national team’s v Sudan back in October, a match that will surely be scribbled on African football’s epitaph; a day we saw unprecedented poznans. But while that match was a crunch play-off tie against their bête noire Sudan, this was club football. Ultimately, the fans would not be rewarded for their exultancy, an insipid Zamalek ploughing through to the group stages via the away goals rule largely thanks to the goalkeeping heroics of Abdulwahid El Sayed. It was the timely headed goals of the deadeyed Ivorian-born Bukinabe Abdoulaye Cisse, this week’s SFG Player of the Week, which would add economy though. The first goal came after just three minutes, negating the away goal in the 1-1 first-leg draw in Cairo and calming the nerves. Then, in the 87th minute, just as St George seemed to be ascending to the lofty heights of the Champions League group stage in their helicopter, the sucker punch – a cross hung at the back post finished with another trademark Cisse diving header. The midfield malevolence of Cameroonian Essadjo William, one of the standout performers on the day, endowed St George with the West African brawn that made the national team seem so featherweight at Afcon, establishing order and dominance in the centre of the park for large spells. Whilst the callow, stern Ugandan centre-back Isaac Isinde, who walloped the goal that put St George in the lead past El Sayed, showed the intransigency and poise that has seen Uganda regarded as one of Africa’s wiliest sides and East Africa’s next big hope. The peril of St George, though, is that they were the reflection of the national team at Afcon 2013: the football they played was delightful yet detrimental, an elixir of amateurism evident in their gung-ho stratagem. But perhaps this self-destructive naivety is to be expected, part of the growing pains that any team needs if it’s to gain access to African football’s first class carriage. St George have certainly won a lot of friends. I, like many, will be looking forward to following their fortunes in the CAF Confederation Cup, Africa’s equivalent of the Europa League, for they made me, seemingly, retreat through the time-space continuum. good article! thanks for paying attention to the passionate but forgotten fans.